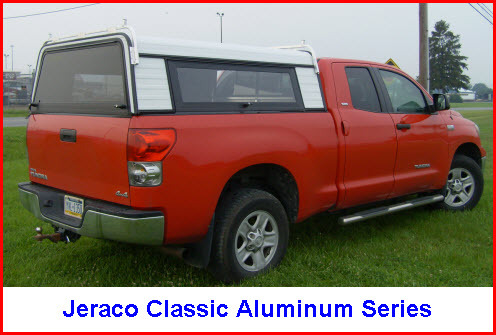 Jeraco Truck Caps in modern fiberglass or traditional aluminum configurations. Jeraco Truck Caps is still a family run business. The company has its roots in the Michigan of the 1960's. The company founder, Harold Fawcett, started out making campers under the brand name WagonMaster. 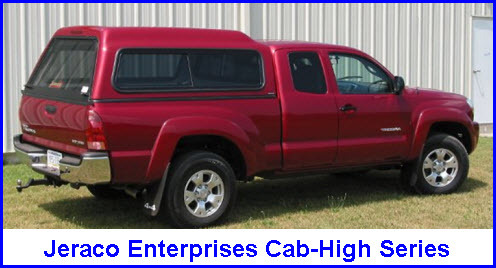 The business evolved into camper tops for pickup trucks and by the early 1970's had outgrew the Michigan facility. So the company packed up and moved to Pennsylvania where the current production facility is located just outside of Milton and run by the son and grandsons of Harold Fawcett. Jeraco Truck Caps manufactures both fiberglass and aluminum pickup truck caps with the same care and attention to customer service today as in the old days in Michigan. Here's some detail on each of the product offerings from Jeraco Enterprises but before we go on I encourage you to check out the Jeraco website. Go to the About Us page and read some more history of the company. Check out the great pics of some of the old camper shells and truck caps that Jeraco has made in the past. You just might have to go with Jeraco after you do! Jeraco Truck Caps line of fiberglass truck caps consists of 4 series. The Cab-High, the Mid-Rise, the High-Rise and the Supreme. The Cab-High Series truck cap is a sleek, contemporary truck cap designed to be tough but still get you all those ohhh's and ahhhh's. The Mid-Rise Series truck cap from Jeraco gives you a couple of extra inches of headroom that translates into a full size rear door and extra space to store stuff. The High-Rise gives you even more headroom and storage than the Mid-Rise Series. It's aerodynamically styled , has an extra large rear door and your choice of side window configurations. The Supreme is for you SUV aficionados that need to make their pickup trucks into an SUV at half the price. The Supreme has an all glass rear door and contoured, flush mounted, vented side windows to give that SUV look and feel. The standard aluminum box for the top of your pickup. The heavy duty version of the Jeraco Truck Caps Classic Aluminum. A high quality commercial grade aluminum truck cap that's strong, versatile and affordable.